Can Arsenal Take the Next Step? 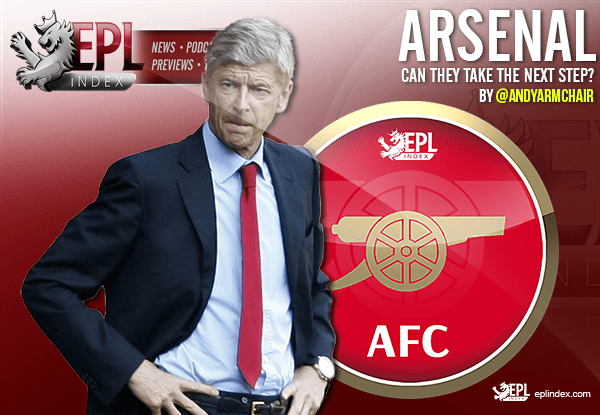 EPL Index > Arsenal > Can Arsenal Take the Next Step? Even as a rival fan, I can appreciate the contribution Arsene Wenger has made not only to Arsenal, but to the Premier League as a whole. Some may disagree, but I feel the Frenchman somewhat revolutionised football in this country when he arrived. From diet and preparation, to philosophy and style of play, to simply being a successful foreign coach, despite most people having never heard of him when he was appointed, Wenger made an impact that will stand the test of time. His first decade in charge of the Gunners brought a tremendous amount of success and all of it with a style of play that was pleasing to the eye. However, his second decade at the helm has not been so fruitful; with successive FA Cup wins ending a nine year trophy drought. That fantastic ‘invincibles’ team of the 2003/04 season was the last to win the Premier League for Arsenal and in the time since, pressure has grown on Wenger to deliver another title. Moving from Highbury to the Emirates stadium hampered Arsenal’s ability to compete financially for a time, as they looked to ensure the club was economically sound during a period of paying off the stadium move, but still remaining competitive on the pitch. Wenger deserves credit for his ability to do just that, because although the Gunners did not win a trophy in that time, they did maintain their position near the top and kept Champions League football a regular fixture. That may be derided by some, but they were competitive and it was done on a budget and there will be plenty of clubs in the Premier League who will testify that is a task easier than it sounds. However, that period of financial constraint has passed and now Arsenal are the most cash rich club in the country, by a considerable distance. The question still remains if Arsenal can translate their economic strength into more success on the pitch because that is where the frustration has grown for fans in recent years. There were signs a three years ago that the frugal approach to the transfer market was loosening with the acquisition of Mesut Özil for £42.5m from Real Madrid and then Alexis Sanchez from Barcelona the following summer. Last year Wenger finally addressed the long standing goalkeeper issue by bringing Petr Cech, but oddly, it was their only business of the summer. Many argued that Arsenal needed a new striker, but more pressing was a commanding central midfielder and a new centre-back partner for Laurent Koscielny, to replace the ageing Per Mertesacker. Despite eventually finishing second in last season’s Premier League, it was largely a disappointing campaign for the Gunners and their fans. With so much upheaval amongst rival clubs that has seen management changes at Manchester City, Chelsea and Manchester United, this could again be an opportunity for Arsenal to use their stability to capitalise. The signing of Granit Xhaka from Borussia Mönchengladbach should solve the midfield conundrum that has hung over Arsenal since the departure of Patrick Vieira. As I’ve written here before on EPL Index, Xhaka not only brings his own individual quality, but will also help others – providing Santi Cazorla with more opportunity to influence, the likes of Francis Coquelin and Mohamed Elneny the room to develop and maybe more freedom for Aaron Ramsey to boot. If Arsenal are to compete for the title this season though, they cannot afford to rest on the laurels of one very good signing once again, they need to strengthen further. Olivier Giroud is better than he’s often given credit for, but his consistency cannot be relied upon and the same can be said for the fitness and consistency of Theo Walcott. Add to that the long term injury of Danny Welbeck and recruiting a quality becomes more of a necessity if the Gunners are to make the most of the creativity that Özil provides and Sanchez is not to be relied upon too heavily. A move for Leicester’s Jamie Vardy early in the transfer window ultimately failed and whilst I still believe he would not have been the right fit, it did illustrate that Wenger recognises another striker is required, but time is running out to the start of the league campaign if the rumoured move for Alexandre Lacazette is to materialise. Another player linked with a move to the Emirates is German defender Shkodran Mustafi, who could be an ideal replacement for Mertesacker with his physical presence and obviously offer much better mobility. Whether it is Mustafi or someone else, the injury to Mertesacker emphasises the need for a centre-back before the end of the window, despite the arrival of England U21 Rob Holding from Bolton. In short, with a couple of quality additions over the next few weeks and Arsenal could be in with a shout for this Premier League and take the next step, but if Wenger gambles on the squad as it is then another season of frustration for Gooners surely awaits. Categories: Arsenal, Arsenal (NN), EPL Index Featured Article, and EPL Team Analysis.' 'Tags: AFC, Arsenal, Arsenal (NN), Arsenal Stats, english Premier league, English Premier League Opta Stats, English Premier League Stats, EPL, Granit Xhaka, premier league, and Premier League Stats.